Sunday, July 12 at 4 p.m. — ROCHESTER — The Rochester Chamber Music Society opens the Green Mountain Suzuki Institute Week with a kick-off concert by Seeing Double on Sunday, July 12 at 4 p.m. in the Rochester Federated Church. Seeing Double is a unique concert of all duo-violin music, proving that the music of two violins can be much more than the sum of its parts! The audience will be taken on a journey from baroque to jazz, with compositions by Telemann, Bunch, Mozart, Suk, Bartόk, Summer, Rόsza, and O’Connor, to name a few. 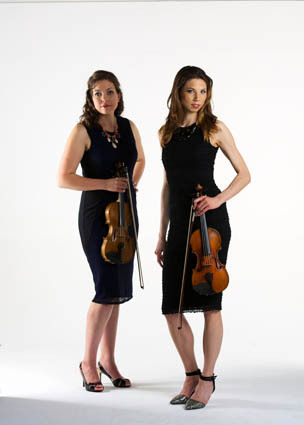 Longtime best friends Sara Whitney and Julia Salerno began performing duo violin concerts while studying together at the University of Michigan. Though currently residing on opposite coasts—Julia as violin/viola professor at Eastern Washington University and Sarah as a violinist in the N.Y.C. based quintet Sybarite5—the concerts have continued over the past decade. This extraordinary opportunity to hear these friends in concert is not to be missed. Sarah Whitney, an active solo and chamber musician, performs worldwide across stages in Europe, Asia, South America and the United States. She has participated in festivals in Italy, France, and China as well as the Aspen Music Festival, the Music Academy of the West and the Spoleto Music Festival. Julia Salerno has been a top prize winner in a variety of competitions nationwide and has soloed with many orchestras throughout the U.S. and in Europe, including the Walla Walla Symphony, Philharmonia Northwest, Spokane Symphony, and the Czech Philharmonic Chamber Orchestra. Salerno is an active chamber musician and teacher and will be joining the staff at the Green Mountain Suzuki Institute in Rochester during the week of July 12–17. For more info, call 802-767-9234 or visit www.rcmsvt.org.